Detailed Information on the Conspiracy Theories of The Titanic's sinking and disaster. Olympic, Mummy Curse, Titanic Books, Excellent information for teachers, students and historians. As Titanic lay in wreckage on the bottom of the Atlantic for over 74 years its disappearance became one of greatest mysteries of the twentieth century. Where was it? And quite simply what happened to it? It seemed almost unbelievable that the largest ever movable man made structure; the world's first 'unsinkable' passenger liner could simply disappear and vanish. An Iceberg was determined to be the cause of the Titanic's demise but many conspiracy theorists refused to believe that such a simple event could bring down one of man’s greatest marvels and as a result conspiracy theories began to be conceived around the globe. As you will find from the selection below some verge from plausible to the downright ridiculous. Was Titanic cursed by an Egyptian mummy? The Titanic's mummy curse is an urban legend, possibly based on the Priestess of Amen-Ra who lived in 1050 B.C. According to legend, after her discovery in the 1890's in Egypt, the purchaser of the mummy ran into serious misfortune. The mummy was then reportedly donated to the British Museum where it supposedly continued to cause mysterious problems for visitors and staff. The mummy was eventually purchased by journalist William, who dismissed the claims of a curse as quirks of circumstance. The legend claims that he arranged for the mummy to be hidden under the body of his car for fear that it would not be taken aboard the Titanic because of its reputation. He reportedly revealed to other passengers the presence of the mummy the night before the accident. Official records state that the British Museum never received the mummy, only the lid of its sarcophagus (which is on display at the museum and known as the "Unlucky Mummy"). Additionally, except during war and special exhibits abroad, the coffin lid has not left the Egyptian room. The Wreck of the Titan - A Premonition? 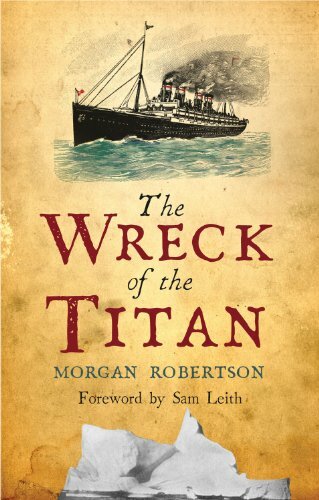 In 1898, a fictional story called 'The wreck of the titan' was written by the author Morgan Robertson, which told the story of a ship called the Titan which hit an iceberg and that there was a lack of lifeboats on this ship. Robertson claimed to be psychic and got his inspiration for this story from his psychic abilities. Although the novel was written before the Olympic-class Titanic had even been designed, there are some remarkable similarities between the fictional and real-life counterparts. Like the Titanic, the fictional ship sank in April in the North Atlantic, and there were not enough lifeboats for the passengers. There are also similarities between the size (800 ft. long for Titan versus 882½ ft. long for the Titanic), speed (25 knots for Titan, 23 knots for Titanic) and life-saving equipment.  Unsinkable: The Titanic was the world’s largest luxury liner (882 feet, displacing 53,000 long tons), and was once described as being (nearly) "unsinkable".  The Titan was the largest craft afloat and the greatest of the works of men (800 feet, displacing 75,000 tons), and was considered "unsinkable".  Lifeboats: The Titanic carried only 20 lifeboats, less than half the number required for her passenger capacity of 3000. The Titan carried "as few as the law allowed", 24 lifeboats, less than half needed for her 3000 capacity.  Struck an iceberg: Moving too fast at 23 knots, the Titanic struck an iceberg on the night of April 14, 1912 in the North Atlantic 400 miles away from Terranova.  Also on an April night in North Atlantic 400 miles from Newfoundland (Terranova), the Titan hit an iceberg while traveling at 25 knots.  The Unsinkable Sank the unsinkable Titanic sank and more than half of her 2208 passengers died.  The indestructible Titan also sank, more than half of her 2500 passengers drowning, their "voices raised in agonized screams."  The Titan does not strike the iceberg a glancing blow on a clear night, as is the case with the Titanic, but drives headlong onto an ice shelf possibly formed by the recent overturning of a berg, rising up and falling on her side.  The Titanic hit the iceberg in perfect sailing conditions, while the Titan hit the iceberg in bad, misty and foggy conditions.  705 people aboard the Titanic were saved, while only 13 of those aboard the Titan survived.  The Titanic sank on her maiden voyage, while the Titan had made several voyages.  Titanic sank while sailing from England to the USA, Titan was traveling in the opposite direction.  The Titan sinks a ship before hitting the ice. The Titanic came close to an accident with the New York but did not actually hit it.  The Titan had sails to improve her speed; Titanic did not. Could a fire have led to to Titanic's demise? Ohio State University engineer Robert Essenhigh released a theory in November 2004 that claims a coal fire led indirectly to the iceberg collision. He claims a pile of stored coal had started to smoulder, and to get control over that situation, more coal was put into the furnaces, leading to unsafe speeds in the iceberg-laden waters. Essenhigh states that records prove that fire control teams were on standby at the ports of Cherbourg and Southampton because of a fire in the stockpile, and that such fires are known to reignite after they have been supposedly extinguished. He suggests that the Titanic actually set off from Southampton with one of its bunkers on fire, or that a spontaneous combustion of coal occurred after the ship left port. Such fires were a common phenomenon aboard coal-fired ships and one of many reasons why marine transportation switched to oil in the early 1900s. It is similarly theorized that such a bunker fire was responsible for the explosion of the USS Maine in 1898, by setting off her powder magazines. Titanic and Olympic were very similar. Could they have been switched for an insurance scam? The Titanic and Olympic were very similar vessels from the exterior One of the most controversial and complex theories was put forward by Robin Gardiner in his book, Titanic: The Ship That Never Sank? In it, Gardiner draws on several events and coincidences that occurred in the months, days, and hours leading up to the sinking of the Titanic, and concludes that the ship that sank was in fact Titanic’s sister Olympic, disguised as Titanic, as an insurance scam. Olympic was the older sister of Titanic, built alongside the more famous vessel but launched in October 1910. Her exterior profile was nearly identical to Titanic, save for small detailing such as the promenade deck windows. These were not glazed in Olympic. In Titanic, the front half of the promenade deck was fitted with smaller glazed windows to protect passengers from spray. On September 20, 1911, the Olympic was involved in a collision with the Royal Navy cruiser HMS Hawke near Southampton. The cruiser smashed its ram into the side of the Olympic, seriously damaging both ships. The inquiry found Hawke free of all blame. This set in motion Gardiner's theory. White Star Line was allegedly not insured for the cost of fixing the damaged Olympic (which, according to Gardiner, had damaged the central turbine's mountings and the keel). The White Star's flagship would also be out of action during any repairs, and the Titanic's completion date would have to be delayed. All this would amount to a serious financial loss for the company. Gardiner proposes that, to make sure at least one vessel would be earning money. Olympic was then converted to become the Titanic. Gardiner states that few parts of either ship bore the name, other than the easily removed lifeboats, bell, compass binnacle, and name badges. Thus, Gardiner believes the Titanic spent 25 years in service as the Olympic. Gardiner uses as evidence the length of Titanic's sea trials. Olympics’ trials in 1910 took two days, including several high speed runs, but Titanic's trials reportedly only lasted for one day, with no working over half-speed. Gardiner says this was because the patched-up hull could not take any long periods of high speed. Gardiner suggests the plan was to dispose of the Olympic to collect insurance money. He supposes that these doors were to be opened at sea to slowly flood the ship. If numerous ships were stationed nearby to take off the passengers, the shortage of lifeboats would not matter as the ship would sink slowly and the boats could make several trips to the rescuers. Gardiner maintains that on April 14, Officer Murdoch was not officially on duty yet was on the bridge because he was one of the few high-ranking officers who knew of the plan and was keeping a watch out for the rescue ships. One of Gardiner's most controversial statements is that the Titanic did not strike an iceberg, but an IMM rescue ship that was drifting on station with its lights out. Gardiner based this hypothesis on the idea that the supposed iceberg was seen at such a short distance by the lookouts on the Titanic because it was actually a darkened ship, and he also does not believe an iceberg could inflict such sustained and serious damage to a steel double-hulled (sic) vessel such as the Titanic. Gardiner further hypothesizes that the ship that was hit by the Titanic was the one seen by the Californian firing distress rockets, and that this explains the perceived inaction of the Californian (which traditionally is seen as failing to come to the rescue of the Titanic after sighting its distress rockets). Gardiner's hypothesis s is that the Californian was not expecting rockets, but a rendezvous. The ice on the deck of the Titanic is explained by Gardiner as ice from the rigging of both the Titanic and the mystery ship it hit. Researchers Bruce Beveridge and Steve Hall took issue with many of Gardiner's claims in their book, Olympic and Titanic: The Truth behind the Conspiracy. Author Mark Chirnside has also raised serious questions about the switch theory. There is also evidence, that Gardiner’s theory is not true. When parts of the wreck were recovered, the construction number 401 was found on all of them. 401 was the Titanic's construction number, the number of the Olympic was 400. There are a number of alternate Titanic Conspiracy Theories. If you of any that you feel should be published please email it to us.